Located on the SE side of Tallahassee off of Capital Circle, Southwood is a master planned community that features homes of all sizes plus shops, amenities, activities, walking trails and more than 1,000 acres of green space. Southwood has continued to provide new construction homes, even during the downturn of the housing market, so you can find homes from brand-new to those that have reached twenty years old. In this report, we will look at prices, values, and sizes of homes in Southwood, as well as show current listings in the Tallahassee MLS and all closed home sales going back to 2003. For each of the 3 real estate graphs found in this report, you will find the number of closed home sales for each year (blue columns, measured on the left vertical axis), and an important real estate statistic shown in red (measured on the right vertical axis. It is important to note that sales are through December for all previous years, but through November in 2014. Average home prices have risen 6% in 2014 versus 2013, but still sit well below the peak of the market prices established in 2007. Distressed sales are are occurring at a rate far lower than other neighborhoods in Tallahassee are seeing, which I believe is the primary reason that we are seeing higher prices this year. Home sales activity this year appears to be consistent with what we have seen over the past seven years, but still well below the levels recorded during the most active years from 2002 through 2006. Thus far in 2014, there have been 131 closed home sales in Southwood. With only 60 homes currently listed for sale in Southwood, the market is balanced and almost leaning to a sellers market. Needless to say, this is great news for homeowners in Southwood who have been waiting to get their homes on the market. 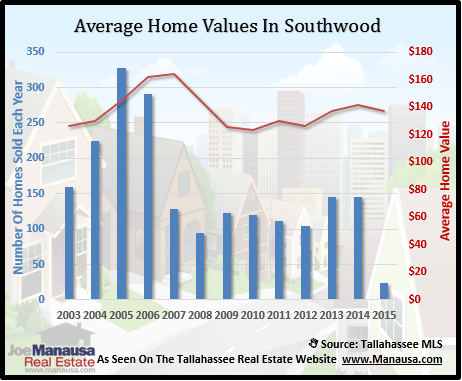 Average home values in Southwood have risen again this year, the second year in a row to see appreciation. Home values have not recovered to where they were at the peak of the market, but they are up 14% since hitting a low back in 2010. 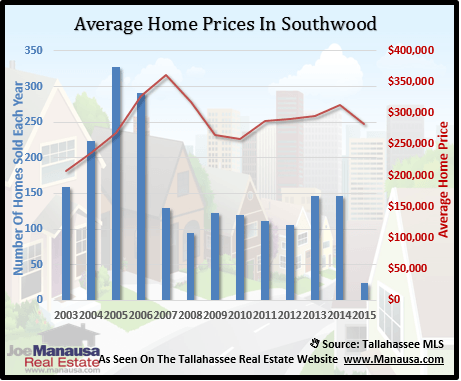 Through November, the average value of a home sold in Southwood has been $141 per square foot. This is up 3% over last year, but still down about 14% from the market high set back in 2007. This means that many homeowners who have been waiting for home values to recover will now be able to successfully sell their homes without having to do a short sale. 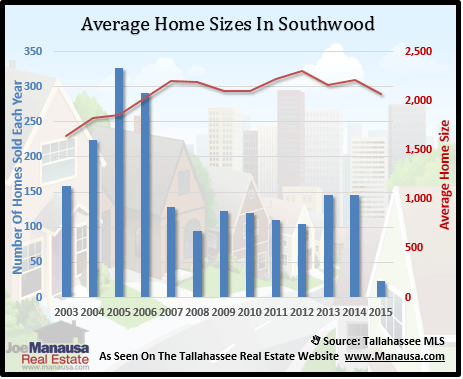 The average home size sold in Southwood falls in a range of 1,600 to 2,300 square feet, a fairly wide range due to the many offerings one can find in this larger-than-most neighborhoods in Tallahassee. The 131 sales thus far in 2014 have averaged 2,211 square feet. The following list of homes are the most recent listings in Southwood. A red box will appear when no homes are listed for sale in the Tallahassee MLS, but check back again on a regular basis as this page updates twice daily. The following list shows home sales going back to 2003 in Southwood. I hope you enjoyed our November 2014 update on home sales in Southwood, please feel free to drop me a note if you have questions not covered in this report.